On this day, in preparation for planned assaults against Iwo Jima, Okinawa, and mainland Japan, Gen. Douglas MacArthur is placed in command of all U.S. ground forces and Adm. Chester Nimitz is placed in command of all U.S. naval forces. This effectively ended the concept of unified commands, in which one man oversaw more than one service from more than one country in a distinct region. Douglas MacArthur’s career was one of striking achievement. His performance during World War I combat in France won him decorations for valor and earned him the distinction of becoming the youngest general in the Army at the time. He retired from the Army in 1934, but was then appointed head of the Philippine Army by its president (the Philippines had U.S. Commonwealth status at the time). Refusing to admit defeat, MacArthur took supreme command of a unified force in the Southwest Pacific, capturing New Guinea from the Japanese with an innovative “leap frog” strategy. True to his word, MacArthur returned to the Philippines in October 1944. With the help of the U.S. Navy, which destroyed the Japanese fleet and left the Japanese garrisons on the islands without reinforcements, the Army defeated the Japanese resistance. In January 1945, he was given control of all American land forces in the Pacific; by March, MacArthur was able to hand control of the Philippine capital back to its president. Admiral Nimitz, a graduate of the U.S. Naval Academy at Annapolis, fought in World War I as chief of staff to the commander of the Atlantic submarine force, an experience that forever convinced him of the efficacy of submarine warfare. 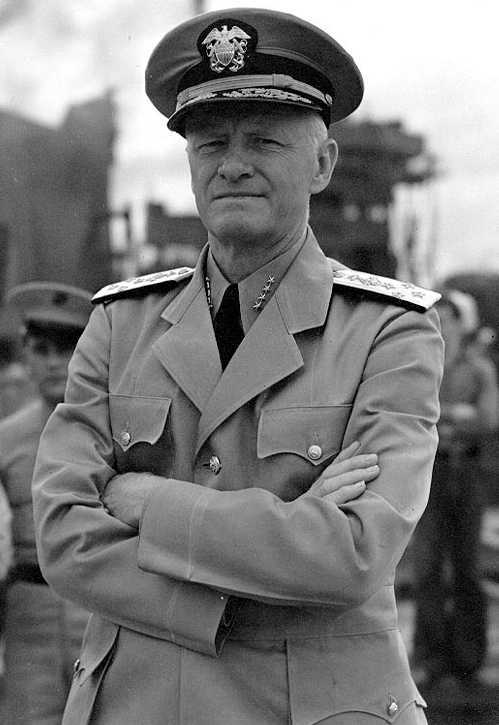 Upon America’s entry into World War II, Nimitz was made commander in chief of the unified Pacific Fleet (Ocean Area), putting him in control of both air and sea forces. He oversaw American victories at Midway and the Battle of the Coral Sea, and directed further victories at the Solomon Islands, the Gilbert Islands, the Philippines, and finally, as commander of all naval forces in the Pacific, in Iwo Jima and Okinawa. Both MacArthur and Nimitz had the honor of accepting the formal Japanese surrender on September 2, 1945, aboard the USS Missouri.